Though mostly old-school cowboy movies show dudes talking over CB radios in shabby cars, these radios are still in fashion. If you wish drifting your car on a muddy trail, bragging over your radio, you’ve come to the right path. We have made an effort to fetch you the best rated Car CB radio and antennas at an affordable price. 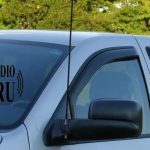 This article will walk you through the best CB radios and antennas to buy for your cars. But first, look at the reasons convincing you that it indeed is a right choice. Surprisingly, there are many good reasons for setting up CB radios in your car. Let’s look at some of them. CB radios require one-time payment only and you don’t need to pay for every call you make with other drivers. This makes it great and feasible for long road trips. CB radios do not require a license. They are perfect for use while driving the car as opposed to cell phones which are prohibited while driving. The emergency channel is always available which makes the car CB radio a must-have. It’s possible that you meet an emergency with a dead cell phone or wander in a low-coverage area. In these situations, CB radios built for cars come in handy to call for rescue. Of course, there are myriad of CB radios in the market, but, each has its own quality. Different vehicles favor different kinds of radios. For this purpose, we’ve outlined the best three radios that work perfectly with cars. 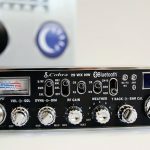 This 40 channel CB radio comes with a front panel microphone connector for making dashboard installation quick and easy. The microphone cord is 9 feet long, helping you to retract it to longer distance. This CB radio has antenna warning indicator along with SWR calibration that aids in the enhancement of performance. You can access to instant Channel 9 for emergency. With this CB radio’s PA capability, you’re able to experience public-address system. The display is easy to use and easy to read with this CB car radio providing you dimmer control. This product from cobra also has switchable noise blanker along with tone control and adjustable mic boost. These features ensure clarity and loudness of your speech. As termed maximum by the law, it gives the full RF power output of 4 watts. Also comes with Bluetooth feature. The best part about it is its ‘Bluetooth’ feature. It works great and is perfect for drivers on road, hooked up to their business. The hands-free mode also helps you eliminate any distractions. The price is reasonable and does not require emptying your wallet. 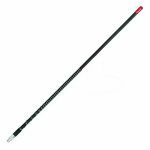 This product is a good installment in Uniden’s ‘Professional’ series. Physically, it is designed to be compact, enabling you to stick it to your small spaces or cars. The radio involves all 40 AM frequencies legalized by FCC. This also has microphone positioned with a perfect sized cord that provides you convenience and relaxation in terms of distance. It incorporates a Superheterodyne circuit that guarantees precise frequency control. It works on phase-locked loop technology. The CB radio uses its built-in noise limiter and ANL switch along with squelch control for blocking noise and enhancing reception quality. With this, you can drop your worries about your car’s engine noise somewhere in the ocean. These features allow you to block unwanted noise disturbing you in the background. Signal/RF Meter helps in adjusting the gain for a better signal level. For perfect read out at a glance, the LED indicators are red-lit. Produces loud and clear sound output. Great in terms of a price corresponding to the quality. May feel compact and small if you favor big devices on your palm. This CB radio is great for cars because of its compact nature. Comes with 40 channels, it can provide the maximum output of 4watt. With available Channel Scan feature, all 40 channels are checked automatically to monitor all activities. The scanning takes place for 5 seconds for each channel. With the great memory feature, you can save up to five channels for immediate access. It also comes with a smart feature that allows you to switch to the last channel you had tuned to before powering off. ANL feature built into your system improves reception, whereas squelch control removes the noise from the background. Comes with NOAA channels for weather updates along with emergency channels. The ‘Dual Watch’ feature enables you to monitor any other channel you desire. For powering you CB system, you will use its six AA batteries that have a battery life extender feature. For making the most out of these batteries, the manufacturers have crafted the high (4w) /low transmit (1w) power settings. Good news is, it also comes with mobile adopter for powering the radio by connecting it to your car’s ‘cigarette lighter’ socket. 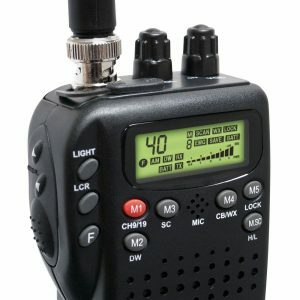 This Midland 75-822 CB radio gives you a multifunctional backlit LCD display. This ensures you a safe drive as it is easy to read in both day and night. You can lock your setting because of which you’re unable to accidentally modify the configuration. This means thudding hands on your car’s radio by mistake won’t change your favorable settings. With external headset jack, you can cruise in your car, experiencing hands-free mode. This radio, best compatible with cars, is user-friendly and provides easy installation, offering easy use. Some of the users may find some difficulty in plugging this radio with the ‘cigarette lighter’ jack in their cars. 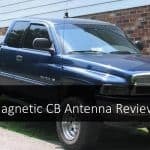 A good driver and an expert CB radio user always know that your hunt for best CB experience doesn’t stop with a CB radio. You need to buy few more accessories to smoothen your experience. Of course, the first one is a good CB antenna. 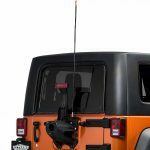 [easyazon_link identifier=”B001AAT94W” locale=”US” tag=”cbradioguru08-20″]WILSON 305-38[/easyazon_link] is the first one that comes into my mind when it comes to cb antenna for Cars. [easyazon_link identifier=”B001JT34MW” locale=”US” tag=”cbradioguru08-20″]K40 M-40[/easyazon_link] is another option you should check on if you’re not interested in the first option. CB radios are a great way to communicate with your friends or to ask for help in case of emergency. There are many kinds of CB radios designed for different vehicles. We hope you’re able to find the best one for your car through our article. But remember, before setting up the CB radio for car, make sure the CB radio offers compatible size and good features. There are many good CB radios that work perfectly with cars like the ones we’ve mentioned. Understand car’s radios features to order for the best products without leaving behind any regret or bad experience. I have an older model Midland 75-820. I run a Little Wilson with it. Any Mods that can be made for more output? Thanks,Troy.